Jesse Reklaw has been making zines and minicomics for over twenty years along with his best-known work, Slow Wave. The latter still has a home at a few alt-weeklies, but it mostly lives these days on the web and in collected form. As such, Reklaw knows as well as anyone how much time, energy and devotion it takes to see one's work get published--especially when one is forced to do it alone. It's one thing to do that as a young twenty-something with boundless energy, but quite another to sustain this level of production. Reklaw's astounding work ethic has led to him not just sustaining an enviable production schedule in terms of his own work, it's enabled his pursuits in teaching as well. At the Independent Publishing Resource Center in Portland, he teaches a Comics Storytelling Workshop as part of their Comics/Graphic Novel track. 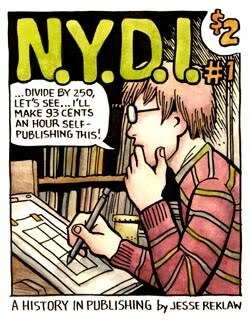 It's in that spirit that he's started a new minicomics series, N.Y.D.I. Billed as "a history in publishing", it's part-autobio and part instructional manual. The title is a gag on DYI ("do it yourself"), the traditional zine mantra, replacing it with "No, You Do It." Reklaw is a master of utilizing unusual structures for autobiographical comics. His Couch Tag stories frame deeper personal details around a list of the cats his family owned or the games that he and his friends created. The excellent Ten Thousand Things To Do is a diary strip that integrates his daily personal and social routines with the real physical and emotional pain he feels on a constant basis. N.Y.D.I slips in details about his father's post-divorce reinvention as a cross-dressing slam poet, his girlfriend's perspective on him becoming a published author and how actually sitting down to draw is a cheering activity. Those details add a richness to his primary narrative framework: a breakdown of how he managed to get various of his comics published over the years. This comic's aim is not to tell people how to publish. 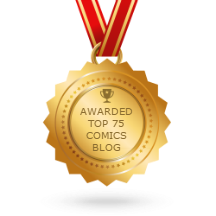 Rather, it's one man's experiences both as a self-publisher and under contract with a variety of comics & book publishers. Reklaw breaks down the process of how he went about self-publishing with a helpful flowchart and later provides charts on format vs cost and the tasks, risks and titles of everyone involved in comic book production, publication and consumption. As an aside, one reason why the charts are so useful and easy to read is that Reklaw is a superb letterer. His lettering is clear, attractive, and the characters are slightly larger than that of the average letterer. While Reklaw uses a lot of hatching and cross-hatching in his drawings to provide a bit of weight, his strips are always composed in such a way as to provide for maximum, immediate clarity. Reklaw also throws in funny asides, where his publishing and promotional selves are personified and engage in arguments with his artistic self. One of the most important tidbits Reklaw drops is that when he was a younger artist, he was delusional as to how much demand there would be for his work. He notes that being delusional is a good thing, because "a little delusion helps you have the perseverance to keep developing". It's a variation on the old mantra of "it takes a thousand pages before you draw your first good one"; if you don't think what you're doing is worthwhile in some way, then why bother at all? Reklaw concludes that working with a "real" publisher after a career doing zines doesn't mean that you're a sell-out. It means that you're trying to find a way to get your work out there with and to as many "kindred spirits" as possible. In other words, "I say: don't sell out...buy in." This issue serves as an initial manifesto as well as a brief & personal history; I'll be curious to see what publishing concepts he addresses in future issues.